About 50 earthquakes occur each day around the world. Although most of these do not have a noticeable effect on life and work, large-magnitude earthquakes occurring near cities and towns can cause catastrophic devastation through destruction of buildings and infrastructure. Earthquakes occurring near coastlines or under oceans also have the ability of generating tsunamis with waves over 100 feet high that can sweep away buildings, causing extensive damage in coastal regions. Immediately following an earthquake, aftershocks, or subsequent earthquakes, may continue for weeks, causing additional damage and hampering recovery. Since 2015, over 10,000 people around the world have died from earthquakes and tsunamis. An earthquake (also known as a quake, tremor or temblor) is the perceptible shaking of the surface of the Earth, resulting from the sudden release of energy in the Earth's crust that creates seismic waves. (a) Damage suffered in Amatrice, Italy, from a M6.2 earthquake on August 24, 2016. Almost 300 people were killed as a result of this Central Italy earthquake (image credit, New York Times). (b) Tsunami resulting from the March-2011 Tohoku M9.1 undersea earthquake in Japan (image credit, ABC). (c) Landslide triggered as a result of the April-2015 Gorkha M7.6 earthquake in Nepal (image credit, Science). To help assess the event and provide situational awareness due to these natural occurrences, NASA utilizes expertise in sensor networks and remote sensing. These data products can support search and rescue efforts and determine disaster impact to aid stakeholder efforts in emergency response and recovery. One example of the NASA Advanced Rapid Imaging and Analysis (ARIA) capabilities is shown below. ARIA relies mainly on satellite radar datasets collected primarily using Copernicus Sentinel 1-A processed by ESA and ALOS-2 SAR instruments. Data products derived from satellite radar datasets are not impacted by cloud cover and can be acquired during day or night. Maps are available between within a day to several days after the earthquake, depending on the availability of earliest post-earthquake radar observations. Examples of damage proxy maps (DPMs) generated following the Central Italy M6.2 earthquake on August 24, 2016. DPMs generated by the Advanced Rapid Imaging and Analysis (ARIA) project and the Copernicus team. ARIA DPMs utilize satellite data to detect locations where an earthquake has caused significant damage (source: http://www.jpl.nasa.gov/spaceimages/details.php?id=PIA21091). Besides these disaster response and recovery tools, NASA can also apply capabilities of its airborne instruments in order to assess the impacts of catastrophic events. These instruments include optical (AVIRIS, AVIRIS-NG), radar (UAVSAR), and LiDAR (ASO) capabilities that can be deployed to image affected areas. An example of UAVSAR relevance to earthquake events is shown below where ground movement is quantified following an initial earthquake. 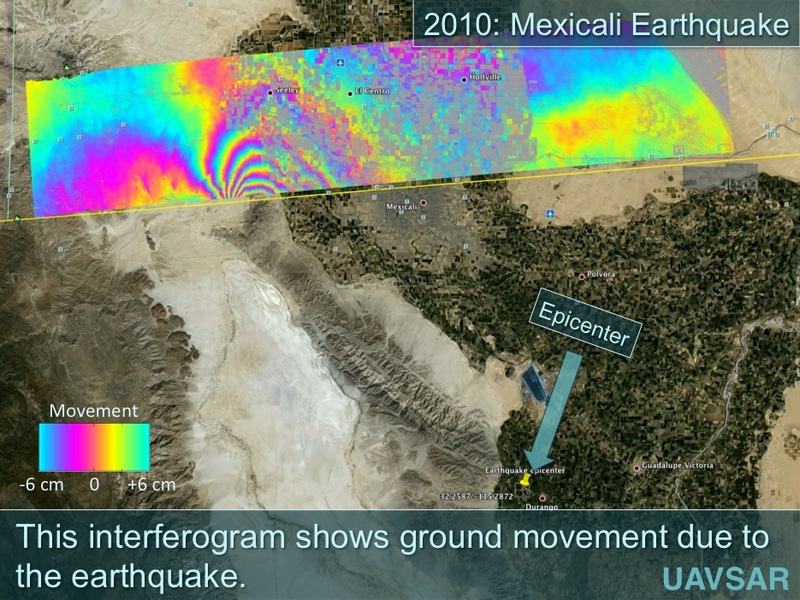 UAVSAR data following the 2010 Mexicali earthquake.